WPAC already responding to the weak nino conditions with a possible intense typhoon threatening many island nations. Let's see if 92W will become stranger than 2015 Typhoon Higos and become the strongest February typhoon ever. 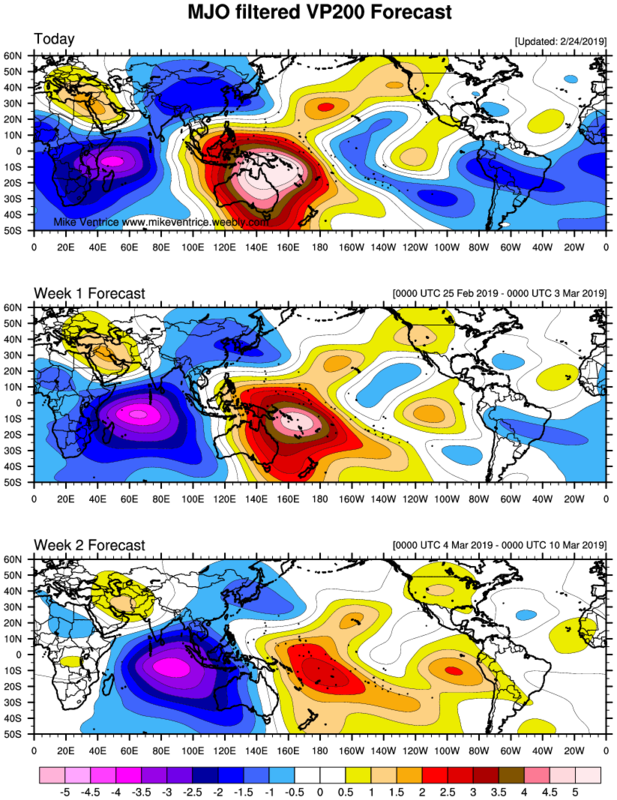 Intense typhoons forming very early in the year usually have big implications in ENSO state. 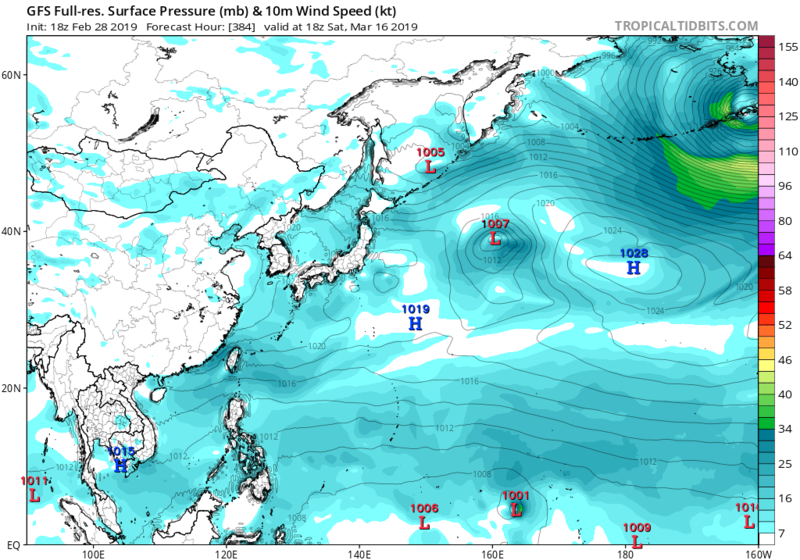 This is what I find really interesting in this kind of situation...do typhoons (or intense cyclones in SHem) forming in Jan-March cause WWBs that later on help in establishing El Nino? Or is it the other way around? It's like a "chicken-or-egg comes first" debate. JMA will provide five-day intensity forecast starting from March 14. Also, JMA plans to introduce, for all forecast times, probability circles based on the cumulative ensemble spread from four models (ECMWF, GFS, UKMO and JMA). This year is shaping up to be historic. PABUK hit southern Thailand back in January. It was named on the 1st of the month making it the earliest TS formation on record and the first TC in the SCS and to hit Thailand so early since 1951. WUTIP expected to pass near Guam. There were two February storms that passed us, one in 1864 and the other in 1953. Last edited by euro6208 on Wed Feb 20, 2019 7:32 pm, edited 1 time in total. Let's see what will unfold. GFS for the second run in a row is showing another TC threatening the Marianas. euro6208 wrote: This year is shaping up to be historic. 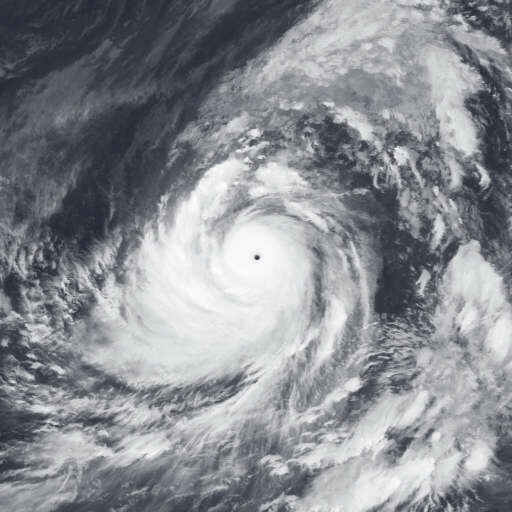 Wutip just beat out 2015's Higos and it is now the STRONGEST FEBRUARY TYPHOON ON RECORD! Possibly the strongest TC in the NHEM so early in the season! A "weak" El Nino producing a February record breaker from 1970's Nancy to 2015's Higos then to 2019's Wutip, if this isn't caused by AGW then I don't know what is it. Hayabusa wrote: A "weak" El Nino producing a February record breaker from 1970's Nancy to 2015's Higos then to 2019's Wutip, if this isn't caused by AGW then I don't know what is it. Probrably has something to do with HAARP. With that technology they can create anything they want. To be fair, Higos '15 occurred after the 2014 El Nino failed to get going and before the 2015 El Nino established itself. If 2019 ends up being part of a double peaking El Nino episode like some guidance is alluding to, then Wutip may have occurred in very similar circumstances to Higos. Could AGW be playing a part in events? It's very possible. However, I'd be hesitant to attribute individual weather events like Wutip to AGW being the primary driver. It's very difficult to separate influences. Usually many mundane events (such as the trend in Houston's daily low temperatures in the summer over many years) is a bigger flag for AGW than individual extreme events. I have a feeling that Wutip's record-breaking this February is some kind of a precursor on the ENSO state for the rest of 2019. I got to agree this feels almost like the double dip EN of 2014-2015, but for that 2015 parallel to stay true we should see more early season intense typhoons like Maysak, Podul and Dolphin. euro6208 wrote: Let's see what will unfold. 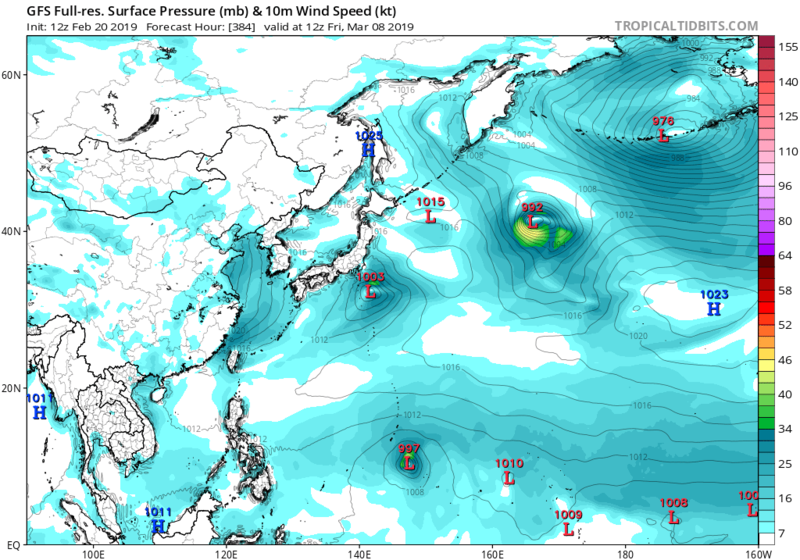 GFS for the second run in a row is showing another TC threatening the Marianas. Looks like GFS lost this the past couple of runs. We'll see. The MJO is forecast to be rampant at this time. The phantom storm is back long range. 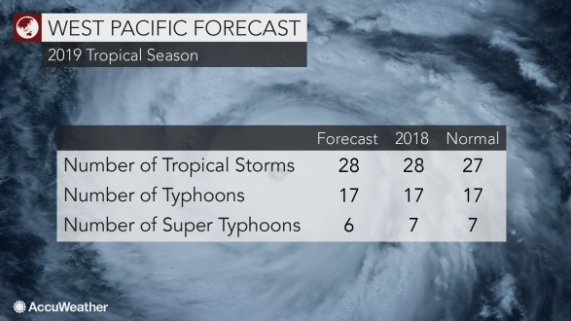 AccuWeather meteorologists are projecting close to the average number of tropical storms, typhoons and super typhoons for the balance of 2019. It keeps getting pushed back but it's still there. EURO and GFS has a few disturbances moving through. GFS continues to be the most robust.